Raised-bed gardening promotes large, vigorous plants. A well-built raised bed provides a sturdy framework for soil, and is easier to weed and water. Raised bed crops are also healthier and more resistant to insects and disease. In additional, the raised sides of the structure discourage rabbits and other critters while providing a ready-made surface for fence posts other protective devices. Deer can wreak havoc on raised-bed gardens. Aside from their voracious appetites, they can damage garden structures and trample your carefully prepared soil. An 8-foot high fence will repel deer most reliably, but for a small number of raised beds, individual cages can be made out of chicken wire. Drive several 4-to-6 foot wooden or metal posts around the perimeter of your beds. Run galvanized or vinyl-coated chicken wire around the outside of the frame, securing the mesh to the posts with twist ties. Other, less aesthetically-questionable solutions include repellent sprays and sachets. There are many different formulations available, ranging from rotten eggs to coyote urine. Repellent sprays require frequent reapplication and some are not suitable for food crops. Repellents can be used in combination with "zappers," battery-operated posts that contain a lure. The deer are attracted to the lure and touch the device to investigate, only to receive a harmless but memorable shock. Famous garden raiders, rabbits can devour your lettuce and carrot crops overnight. 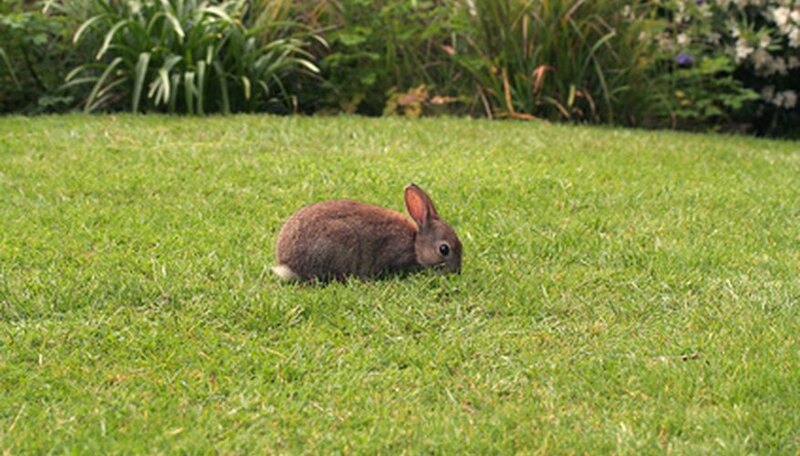 Low fencing, spray repellents and certain plants can repel rabbits. To build a rabbit fence, dig a trench at least 4 inches deep around the perimeter of your raised bed. This will prevent rabbits from digging under the bottom edge. Extend your chosen material--chicken wire, bamboo, vinyl mesh--about 2 feet above your raised bed. For added protection, use a food-safe repellent spray on rabbit favorites like lettuce and carrots. Rabbits generally avoid garlic, onions, marigolds and lavender, so a mixed border of these plants can act as a natural repellent. Gophers and moles tunnel under fences to get at your garden goods. Galvanized chicken wire is your best defense against these marauders. When building your beds, dig the soil out to a depth of about 12 to 18 inches. Lay chicken wire in the bottom of the bed and extend the material up the sides. Fill the beds with your planting mix--the roots of your crops will pass through the mesh as they grow. Fence the beds with additional chicken wire, making sure the above-ground fencing meets and is secured to the underground mesh. For added security, consider adding a predatory house cat or a fake owl statue. Battery-operated sonic devices are also available. Pushed into the soil, they emit a sound that is repellent to moles. Insects are the most common pest in vegetable gardens and there are many ways to deter them. A well-tended garden is naturally resistant to insects, but even the healthiest garden can fall victim to bug attacks. Floating row covers, lightweight and porous, can be laid over crops to protect from winged insects. Flexible metal row hoops, available from nursery and garden-supply stores, can be installed to support heavier-weight covers. The frame of the raised garden bed holds these hoops firmly in place. If slugs are crawling into your beds, line the tops of the raised bed edges with copper tape or slug repellent; crawling critters like slugs will not cross this barrier. In most cases, birds are a welcome addition to any garden, but they can eat the ripening fruit in your raised-bed garden. If so, wrap vulnerable plants with bird netting. Alternatively, install 1 inch wide wood or metal posts around the perimeter of the raised bed and string reflective tape in a random pattern from post to post. Posts can be inserted into the soil or permanently attached to the outer surface of your raised bed.